Throughout history there have been fiery trail-blazing women who spoke their truth and changed history. And the 2018 Joan Chittister Calendar honors 12 of them. 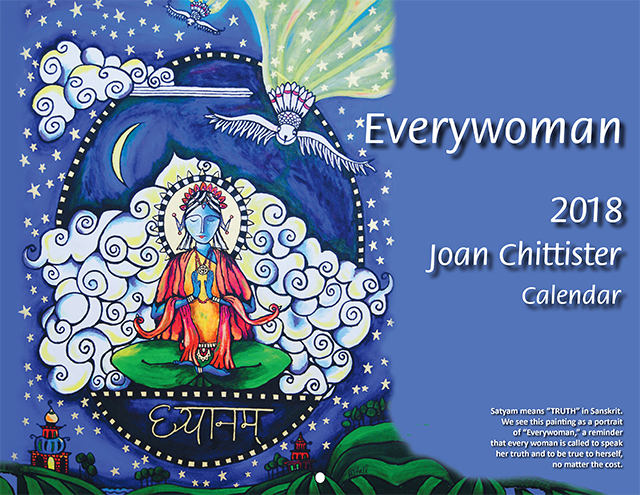 Insightful and inspiring quotes from Sister Joan echo the wisdom of such luminaries as Fannie Lou Hamer, Joan of Arc, Four Women Martyrs of El Salvador, Susan B. Anthony, Rachel Carson… Artist Marcy Hall (2016 Joan Chittister calendar) returns with her vibrant, whimsical yet deeply reflective paintings that capture the essence of each of these remarkable women. BONUS GIFT INCLUDED: In this year’s calendar there is a two-page tear-out that contains a 3.5"x4.25" bookmark of each of the monthly paintings and quotes with a brief biography of the featured women on the reverse side. Presto! Cut them apart and you have a calendar and a small gift to send to 12 friends. View larger images of each page and read quotes here. Quantity Discounts: 1- 2 calendars....$10.00 ea. 25 or more $6.00 ea. Opens to 11" x 17"
ALSO AVAILABLE: We have made the set of 12 bookmarks available for purchase apart from the calendar. Printed on sturdy cardstock, each 3.5"x4.25" card features the same quotes as the calendar pages and on the reverse is a short biography of each woman. Order here.